Before John Mozeliak dips his beak into the starting pitching market, he had to close doors and lock up one of his current soldiers. 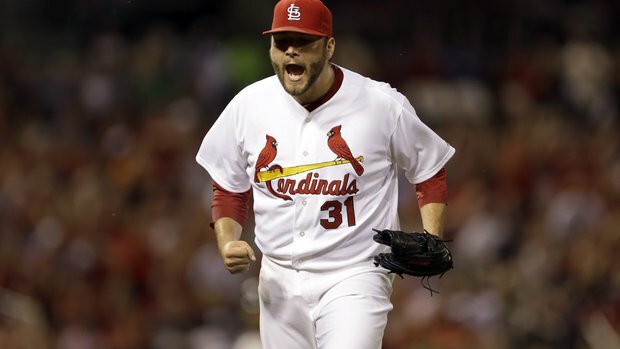 Righthander Lance Lynn and the Cardinals reached a three year extension agreement worth 22 million. When it comes to timing and a need to lock up the one 100 percent arm in your rotation, the deal works out perfectly. Last night on United Cardinal Bloggers Radio, I was talking with A.J. Blankenship about a potential 6 year deal in the works. Later, Cards blogger and mastermind Bob Netherton chimed in and said it would be more like 4 years and 36 million. It’s a good thing Bob is around to keep a harness on the younger maniacs in this fanbase and writing community, because he knows his stuff. Need proof? Read his column from yesterday afternoon. Lynn and the Cards wipe away arbitration with this deal and sets up the rotation for the coming years. I’ve said all along that Lynn’s ascension in 2014 paints the picture that a need for a #1 type like Max Scherzer or Cole Hamels isn’t required in the offseason. Hypothetically, if Adam Wainwright or Michael Wacha went down, Lynn is now the type of pitcher to be able to step into a higher spot in the rotation and provide those kind of innings. After a season where he shaved his ERA down to under 3.00 and logged another 200 innings without breaking down late in the season, Lynn was due for an extension and ownership of more responsibility in on this pitching staff. He is being paid the kind of money that #3 or #4 starters make but could potentially provide top tier performance. It’s wise all around. Welcome to the big boy panel, Mr. Lynn. Also, welcome to twitter as well, as Jimmy the Cat Hayes has declared the pitcher is on the social media network and released this tweet to fans just a short while ago. Mo can now go back to monitoring the starting pitching market. Let’s be clear. He doesn’t have to do anything right now. He can ride into the season with Wainwright, Wacha, Lynn, Lackey and Martinez with Marco Gonzales in the hole or he can go out and acquire a pitcher via trade or a signing. Every move will include risk. If he signs Max, he is taking a 30 year old pitcher with a lot of innings, wear and tear on his arm, who will give you 6 innings every time out on average. Price will cost you prospects and is a rental. Hamels is a longer guarantee but has a ton of innings and will cost you a lot of depth in your farm system. Mo could stay pat and that could be risky if 1 or 2 injuries occur early on. Every move carries risk for a general manager. The good thing is he locked up a young horse in Lynn and that stabilizes a rotation that is getting younger by the season. It’s reasonable to assume in 2017 that Lynn, Martinez and Gonzales are anchoring the rotation. Right now, at this moment, that is the plan. If Mo alters it, he will do it because he deems it reasonable, necessary and important to the long term success of this team. A big trade or signing isn’t Mo’s style, but I trust the Bowtie and Ivy League education equipped fella to make the right decision. For now, let’s celebrate another expert signing. Lance Lynn is a Cardinal through 2017. After the Matt Carpenter extension, I predicted Lynn would be the next guy. While people will point to the Allen Craig extension as a bad move, the extinguishing of that contract via the Boston trade was well done and didn’t cost the Cards much. Who is next? Jason Heyward has to be the target. The Cardinals didn’t make the Shelby Miller trade to get one year of Heyward, a 25 year old gold glove caliber right fielder with pop and an ability to get on base. A Heyward deal is in the cards next. Ladies and gents, it’s nearly a month before spring training begins. Set your clocks for warmer weather, green grass and intense baseball action. The offseason is coming to its conclusion.